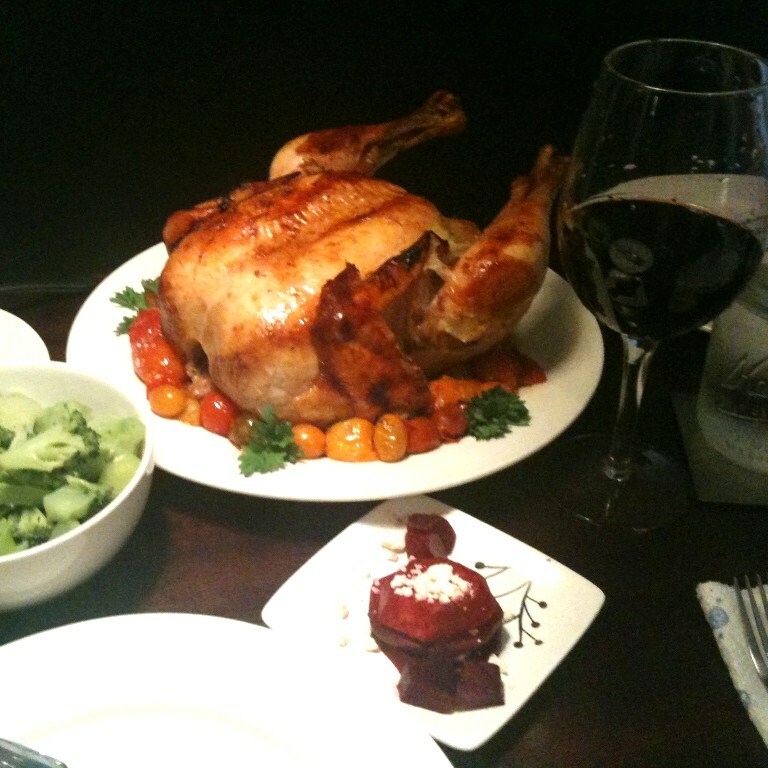 Roasted Chicken, Revisted « I'd rather be in France. The word on the street is that the test of a true chef is his or her roasted chicken (I can’t find a good cite for this statement but I swear I’m not making it up), and I have been determined to prove myself competent on this seemingly simple dish. So many times have I slathered butter in the internal cavity of a raw chicken and tied its legs together into a tight bundle of poultry. So many times have I hovered over a hot oven, obediently basting these baking bird bodies every 8-10 minutes and burning my fingers as I religiously go through the gymnastics of five minutes on the left side, five minutes on the right side, five minutes on the back side, thirty minutes on the left side, thirty minutes on the right side, and twenty minutes on the back side. Every time, the chicken was a perfect toasted golden brown and juicy on the inside. But the skin was not crispy. Curses, ye gods of the French cuisine! My elusive great white whale. Why is your skin not crispy? Finally, during the weekend of Hurricane Irene, having plenty of free time trapped indoors and with my two friends as captive dinner guests, I tried once more. This time I remembered to dry the chicken first. It was a textbook-perfect success. The benefit of cooking this same recipe six times now (other than finally remembering to perform that crucial step) is that I have the whole process memorized. 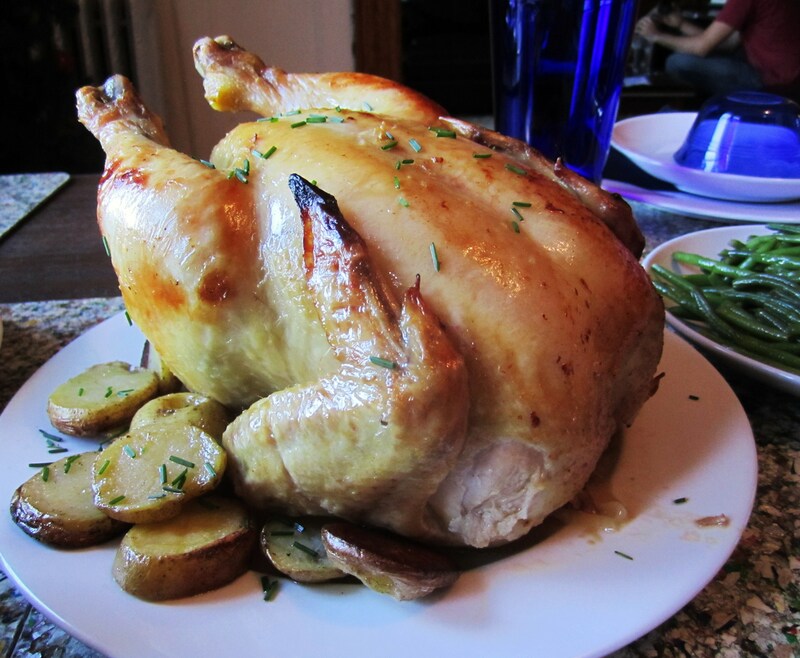 You don’t have to use Julia Child’s labor-intensive protocol, but if you are a friend of the kitchen, you should have a roasted chicken recipe in your back pocket that you can whip out should a hurricane force you indoors for 48 hours. It is also good for boyfriends or girlfriends or just friends or anyone else you want to treat to something special. This entry was posted on September 30th, 2011 at 2:34 am and is filed under La Cuisine. You can follow any responses to this entry through the RSS 2.0 feed. You can leave a response, or trackback from your own site.